The title of this book reads like a manly gauntlet thrown down: go ahead; I dare you not to cry. The expectation of this book is to strike the tragic chord to effect tears, but not all of its tears are produced by extreme loss. Some of the tears are drawn from awe-inspiring beauty, and even humor. It seems disjointed. Aside from personal connections with the author, I’m not sure how this anthology was assembled. The connections being the people whom the author asked what poems make them teary-eyed. The people asked range from film stars to famous poets. Each person gives a brief history of either their connection to the poem, the poem’s history, or—and here is what drove me nuts—some random story that didn’t explain the poem’s connection. For instance, one of the featured people of this book is Sir Patrick Stewart. Cool, right? Well, hold on. Stewart provides the author with a one-paragraph story of eating breakfast at his friends’ house in New York, then going out and crying at the sight of a New England’s Fall leaves (I’m assuming they were on the boarder of a New England state). Then the poem. The poem talked about God’s beauty and it was a great poem, but no mention of the poem was made in the story. Another poem’s introduction is a person that said they laughed hysterically, and didn’t know why. It just did. 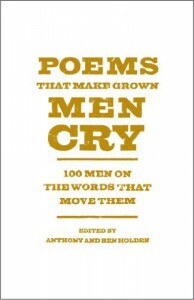 And yet, there are quite a few poems with more lengthy and interesting introductions: personal stories and poems’ histories are shared. I just wish all the poems had a more personalized introduction. The book’s editing threw me off. It could be my electronic galley version, so I would hope the print version of this book looks better. As for my copy, the interviewee’s name appeared then the poet’s name, then the personal story, then the poem itself, and finally the background information about the interviewee. Sometimes the author would interject with some brief history of the poem, where it needed clarification. I would have preferred the title of the poem up front. The current layout didn’t flow as it should have. And I know it is nitpicky, but that cover is pretty bland. Overall, the selection of poems and personal stories were satisfying. I’m not sure the challenge had been met of making grown men cry, let alone any adult, despite the orientation. There wasn’t an obvious consistency. Maybe if the book was edited a bit better, and maybe if the authors extended their interviewees statements more, it would have turned out a bit more spectacular. Thank you to Simon & Schuster for providing me with a review copy of this book.